In order to implement the consensus reached between Premier Wen Jiabao and British Prime Minister David Cameron during Premier Wen’s visit to the UK last June, China State Intellectual Property Office, UK Intellectual Property Office, UK Trade and Investment and China-Britain Business Council jointly held the China-UK Intellectual Property Symposium in London on December 8. Commissioner Tian Lipu of China State Intellectual Property Office, Chargé d’Affaires Qin Gang of the Chinese Embassy in London, British FCO Minister of State Lord Howell, Baroness Wilcox, the Parliamentary Secretary for Business, Innovation and Skills, Chief Executive and Comptroller-General John Alty of UK Intellectual Property Office and Sir David Brewer of China-Britain Business Council were present, and over 100 professionals from the business communities of China and the UK attended the symposium. At the meeting, the two sides had open, pragmatic and professional discussions on the value of IPR in trade, innovation and economic growth, IPR protection in China and the UK, facilitation of technology transfer and the models of law enforcement in China and the UK. The Symposium has deepened common understandings and attained favorable results. On December 9, a meeting between heads of China Intellectual Property Office and UK Intellectual Property Office was held in New Port Wales where the UK Intellectual Property Office is headquartered. Commissioner Tian Lipu, Chief Executive and Comptroller-General John Alty of UK Intellectual Property Office and other officials attended that meeting. 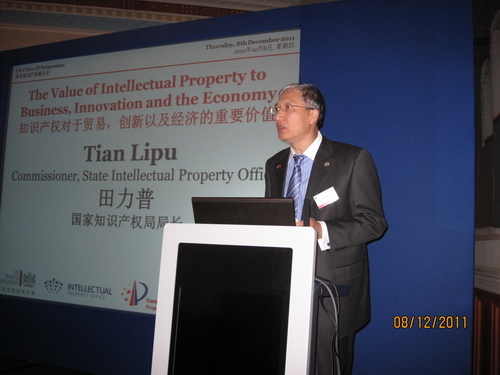 A parallel session was also held between the two sides at the sub-centre of UK Intellectual Property Office in London. The meeting mainly reviewed and summarized the relevant information on the symposium held on December 8, and both sides discussed further cooperation in IPR and exchanged views on IPR businesses.